SEOmoz has updated its Google ranking factors survey 2009 with the following presentation from SMX Elite Sydney. Before we look at the 2011 update, let’s mind ourselves about the original 2009 results (illustrated below). 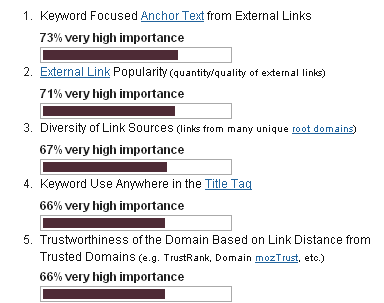 The top 5 ranking factors contained 4 link building factors, with only one position in the top 5 pertaining to on-page content (in this case keyword use anywhere in the title tag). Social signals cannot be ignored as a ranking factor – they are highly correlated! Nofollow links may well help with ranking! Before looking at the presentation, bear in mind that this is early data taken from 132 SEO professionals. And furthermore, as stated on slide 4, opinions are not facts! Thanks for sharing your views on these latest figures. I saw a comment recently on another site about this latest release that says “this proves that SEO is a science and adds credibility to the whole SEO process and the industry as a whole”. While I can agree with that, the problem that really remains is that there are thousands of small business owners with websites out there who will not even know that this data has become available, and even if they did, many would not know how to go about making effective use of the data to improve their website. The reason for that is many small business owners are still dealing with website agencies that are either just programmers or designers who are churning out sites without talking first with a marketing expert to ensure that what is being built for the business owner will meet with their own and customers expectations. Business owners of course are not taking sufficient time to plan a website properly before inviting the web developer to build pages which in many cases fail to achieve conversion. The moral of the story, business owners must start to become more educated in this stuff, and website agencies need to ditch the pride thing and start collaborating more with Internet Marketing Experts who only wants a win win situation for all who are involved in the mix! OnlineXcellence.com is trying to get that message over to the small businesses of Scotland right now, so that we can see a reduction in website failure.